Hip fracture is a serious clinical event which requires surgery in the vast majority of cases. In the period of time between admission and intervention, which may vary depending on many factors, skin traction in the affected member is traditionally applied to immobilize the limb and thus relieve pain. Furthermore, some surgeons maintain that this practice better reduces fracture risk, avoiding muscular contraction, which may facilitate the surgical process. Its use is recommended in managing protocols for this patient group in some hospitals, although some question this practice as lacking evidence to support it. On the other hand, it is not harmless, with a number of reported complications which raise questions about its routine use. This paper reviews the main studies carried out, with the objective of making a recommendation for the clinical management of this issue based on available evidence. Hip fracture is among the most feared consequences related to bone fragility, a serious process that implies high morbidity and considerable mortality that use resources. Most of these patients undergo surgery in an effort to recover the functionality they previously had. Quality standards recommend carrying out surgery within the first 48 hours, since early intervention is associated with fewer complications, better functional results, shorter hospital stay, fewer readmissions, and even, some studies suggest, to a decrease in mortality1. However, in many cases this surgery is delayed for an undesirably long period. The average delay of surgery in Spain is usually about 3 days1,2, due largely to clinical and organizational causes. In this preoperative interval, patients in some centers are routinely given skin traction with a variable weight depending on their constitution, aimed at reducing pain by immobilizing the limb (Figure 1). Some surgeons also believe there are other benefits. In theory, traction may reduce muscle contracture, which is potentially beneficial for the surgery itself, especially if the intervention consists of an osteosynthesis of the fracture, whose reduction and management would be hypothetically less difficult. But there is really no evidence in either one way or the other. The bibliography is compelling. Additionally, not only a series of adverse effects are described that make this practice apart from not being really beneficial, it can even be harmful, but also, the basic management of these patients in simple matters such as hygiene or the prevention of ulcers. Pressure can be more complicated if patients are "subject" to this immobilization system. Thus, we believe it is worthwhile to undertake this review and offer recommendations based on what is described in the literature. For this review, a bibliographic search was carried out in January 2018, in both English and Spanish. The following databases were consulted: Pubmed, Scopus and EMBASE. The search strategy included the following terms in English: hip fracture, skin traction, pain and preoperative traction. It was extended with the terms in Spanish: fractura de cadera, tracción cutánea, dolor, tracción preoperatoria. In conclusion, the last review carried out by the Cochrane Library in 2011 is consulted. Of all the articles found, only those whose design consists of randomized prospective studies are selected. We selected 14 studies that are summarized in Table 1, ordered by date of publication and with their main characteristics3-16. In one of the first published studies3, 80 patients were studied with the three classic types of fractures, cervical, intertrochanteric and sub-trochanteric, for which they underwent skeletal traction, skin traction or simply placing a pillow under the affected limb. Regarding required analgesia, it was greater in the skeletal traction group, being similar in the other two groups. The reduction of the fracture was carried out in less time in patients without previous traction, and the bleeding was greater in patients with skeletal traction. The authors concluded that there are no advantages in the placement of any type of traction. As for skeletal traction, it has already been shown in other studies6 that its placement in patients with hip fracture does not show differences in terms of pain relief. It is a painful procedure for most patients who are being treated. 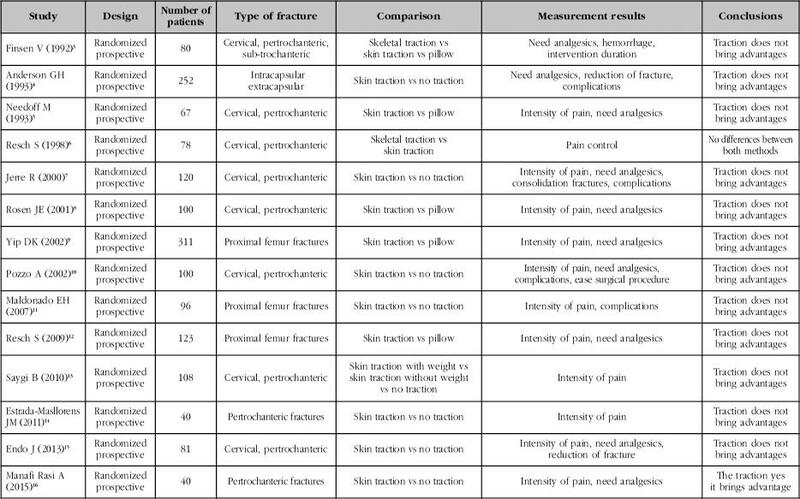 In a similar study by other authors, 67 patients were evaluated not only for analgesic need, but also pain intensity with pain measurement scales5, they found no differences between the groups with and without traction. In another study involving a larger number of patients4, 137 with extracapsular fractures versus 115 with intracapsular fractures were prospectively randomized, so that 101 patients were placed on traction and 151 were not. Pain perception and the need for analgesia were similar in all groups and the authors recommended abandoning the routine of placing traction prior to surgery. This was not only because of the absence of benefits, but as they considered it a waste of time and money. In this study, they also considered the subjective surgeons’ "sensation" regarding the difficulty of reducing the fracture, without finding significant differences between the groups. In addition, the correction of the femoral head position in the displaced cervical fractures with the placement of the traction was emphasized. In theory, the correction of the external rotation of the limb could prevent the occlusion of the posterior capsular vessels. On the other hand, intracapsular pressure could increase, which could compromise the vascularization of the femoral head. These arguments are based on previous studies of intracapsular pressure measurements in non-displaced femoral cervical fractures17, in which it is determined that the semi-flexion and external rotation position of the limb is the one with the lowest pressure and, probably, the greatest patient comfort. The position in extension and medial rotation (which is induced with traction) is the one that presents higher figures of intracapsular pressure. The authors already recommended not placing traction in this type of fracture, since it better corrects the patient’s physiological posture. In another study with a similar design in 120 patients7, similar conclusions were reached. There is no beneficial effect with traction, in the improvement of pain or in the quality of fracture reduction. In addition, they also did not find differences in their consolidation process. They influenced the possibility of complications with traction; in five of the patients, secondary skin lesions appeared. Cutaneous lesions are usually the most frequent, since the skin of the elderly is more fragile and easier to lacerate. Sometimes they can be serious18,19. Neurological complications of a certain entity have also been described20. In the first work proposed to compare the use of a skin traction with the placement of a pillow under the affected limb, well designed, randomized and prospective, carried out in 50 patients in each group8. The patients with the pillow were more comfortable and needed less medication than those who had traction. In another prospective randomized study, carried out in 201 patients with traction and 172 without traction, in which pain was measured at various times of admission9, an increase in pain was observed at the time of admission, with an increased need for pain medication in patients without traction versus those who had traction, but without significant differences, since there is also more pain and more need for analgesia in patients with traction upon admission. The presented graphs are significant. This causes us to question whether it is logical that in the initial moments there is more pain. The patient suffers the fall, is taken to hospital (by ambulance in the best of cases) and transferred several times (emergency stretcher, xrays) until finally placed in the traumatology bed awaiting their intervention. But over time that pain is reduced, whether you have traction or not. This may explain many surgeons’ "impression" that their patients improve with traction. They improve because the pain lessens with time, regardless of whether they have traction or not. This issue is also seen in a randomized study conducted in the field of nursing only in patients with pertrochanteric fractures, and with the aim of assessing their degree of pain depending on whether or not they have traction14. A similar graph was observed, with pain decrease in the analog visual scale with the passage of hours, but in a parallel way and without differences in both groups. One issue that was raised in this study was the perception of difficulty in mobilizing the patient, which initially was higher in patients without traction, but that decreased over time, although the authors acknowledge that it is a question that is difficult to measure. In that sense, there are works that contemplate the opinion of nursing staff in reference to the care and cleanliness of patients, more difficult when the patient has a skin traction, presenting the same discomfort when mobilized, whether or not they have traction10. There are studies into the effect of traction with several days delay. In a Japanese study in which the average delay was 7.5 days before surgery, no significant differences were found in patients who had traction compared to those who did not15. In addition, despite spending several days, they also found no difference in the quality of fracture reduction after surgery. Again, the initial pain scheme is established upon admission, but it decreases over time, regardless of whether the patient has traction or not. In a curious study that evaluated the possible placebo effect in the placement of skin traction13, patients with hip fracture were separated into three groups: some patients were placed with a certain weight, others were placed without weight, and in a third, a pillow was placed under the extremity. The three groups presented a reduction in pain, but strikingly, this reduction was greater in the patients to whom the traction was placed without the corresponding weight. We have only found an article that recommends the use of traction16. 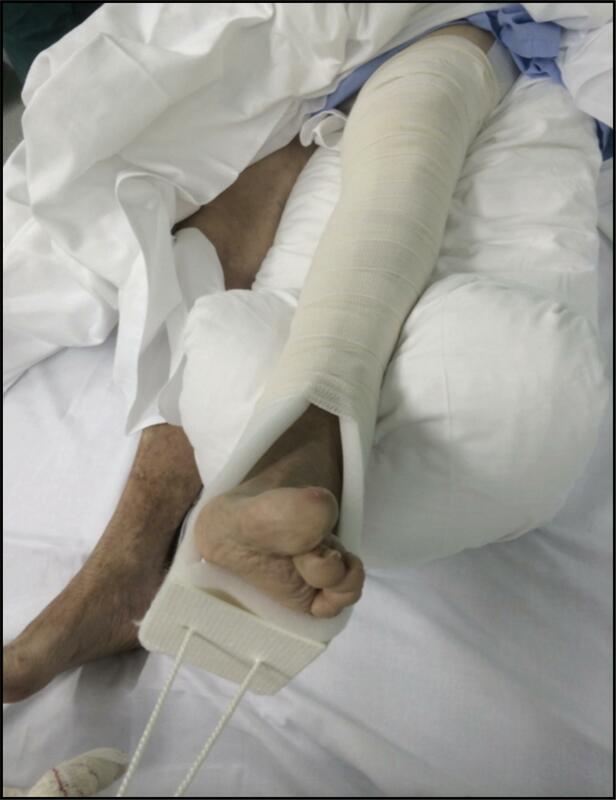 He analyzed only 40 patients with intertrochanteric fractures and only in the first 24 hours. Of the five pain measurements carried out on patients with and without traction, only in one of them, at the end of the day, presented a significant difference in favor of patients with traction. The authors acknowledged that there was no greater demand for analgesia in either group. Despite the discreet results of the work, they recommended the use of traction to provide "greater comfort and relaxation." Finally, the Cochrane review, both in its 2006 edition and the last edition of the year 201121,22, establishes that the use of traction apparently does not provide any benefit and that the evidence in this aspect is increasing, inviting clinicians that persist in their use to stop doing it or to do it under the favorable results of a well-designed randomized trial. Based on the current evidence and in accordance with the best practices for the management of hip fracture in the elderly23,24, we believe that the application of skin traction in patients with hip fracture waiting to be operated on should be eliminated from routine practice in those centers that still perform it25. There is no evidence to support that their supposed benefits, the improvement of pain and a better reduction of the fracture that facilitates the surgery, are real. A pillow under the affected limb seems the most effective measure to provide greater comfort to these patients in the preoperative period.